Still most commonly known as The Road Warrior in North America due to the first Mad Max film's comparative obscurity, Mad Max 2 is a landmark of post-apocalyptic action cinema. Resourceful Australian director/co-writer George Miller distilled the second chapter of his dystopian junk punk peak oil paranoia triptych into a lean beast of relentless action. Any attempts to pick at the story's logic – motorcycles really wouldn't be a viable mode of transport for a gang of marauding fetish gear rapists in a gas-strapped future, no matter how cool or threatening they think it makes them look – results in a swift unravelling, so The Road Warrior is most easily appreciated as simple visceral entertainment for passive adrenaline junkies. There's very little in the way of plot or character development to impede on (or enrich) the torrent of quirky violence and inventive, extensive vehicular assault the film is famous for. Driven over the edge by the murder of his wife and son in the previous film (covered in a pulpy back and white introductory recap), a post-vengeance spree Max (Mel Gibson) aimlessly drives across the Australian wasteland with a cute and vicious Blue Heeler for company, collecting the essentials as he goes: gas and dog food. From here, the story takes its cues from the classic lone wanderer formula: initially only concerned with his own survival, the lethal outsider grudgingly agrees to help a peaceful insular community beleaguered by bandits. Max's stoic constitution reinforces the comforting hero myth that a noble badass will always prevail in the face of seemingly insurmountable adversity, though Miller doesn't get too caught up in sentimentality. Even being a loveable dog doesn't ensure safety in this harsh socially degraded environment. Since it was achieved mostly with practical effects, the film has aged well visually, which is aided by Miller's smart use of quick cuts to minimize the negative impact of any cheap props. The pulpy bombastic score hasn't lost any lustre either. 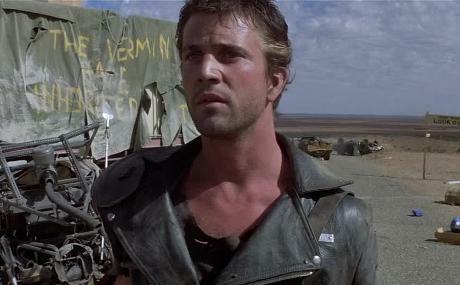 The Road Warrior's lasting impact on post-apocalyptic sci-fi (even after Waterworld paraded its skin around in public like a farcical meat suit) can be partly attributed to Miller's effective, efficient filmmaking, junkyard ingenuity and malleable storytelling; the plot and character motivations are so vague that they're easy for audiences to project their own meaning on to. On a deeper level, tales of the fall of civilization have a universal appeal for anyone dissatisfied with the current status quo. It's a romanticized fascination that seldom addresses the commensurate hardships, though. Being the ego-obsessed culture we are, there's a naïve tendency to feel that we could do a better job given the opportunity to rebuild society according to our own rules. Also, indulging in fantasies of a dangerous new world where testicle sweat rules supreme serves as a distraction from the knowledge that the world is always a random, dangerous place where any moment may bring a swift, unexpected, lights out. Burly psychos trying to kill you for resources is easier to face than a fatal disease or random accident. The world isn't going to end any time soon, but yours could, so why not have a little fun at the movies?